Every day seems to bring new revelations in the area of neuroscience. Obama’s BRAIN project appears to being paying dividends. ust in the last month or so, we have learned that scientists have been working on “neural dust” to create a remote-controlled computer pathway to the brain; and that scientists have been successful implanting false memories in mice. This was followed by an experiment at Harvard that enabled a human to remote control a mouse by thought alone. And, just like that, the next level has already been reached: remote controlled humans … via the Internet. We recently reported on the release of a secret DARPA mind control program at Arizona State University. Part of that research was focused specifically on the attempt to replicate through language the same results obtained with Transcranial Magnetic Stimulation, which is a way to directly control movements, speech, and one’s perception of reality via electromagnetic waves aimed at the cerebral cortex. Julie Beal also reported on DARPA’s solicitation for portable brain recorders that could eventually be used in every classroom in America. Clearly there is a will to put research into action. As is typical, researchers are downplaying the technology by stressing that this type of stimulation is only possible through consenting participants. Yet they repeatedly tout how wonderful it is because it is “non-invasive.” With nanotechnology such as that used in neural dust, a pathway can easily be opened non-invasively (or surreptitiously), and control can be achieved wirelessly. 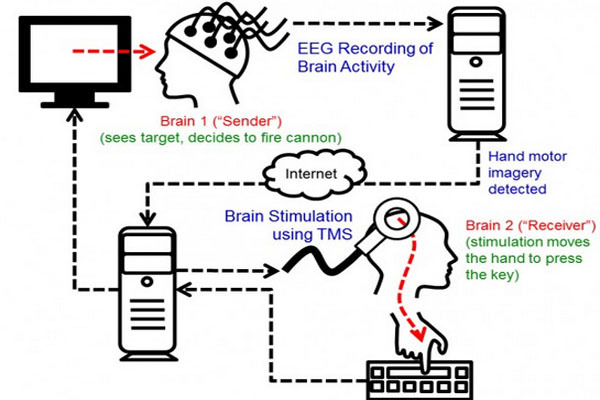 Julie Beal has speculated that perhaps this type of wireless control over another human being’s brain contributed to the strange “short circuits” that have been seen in many news reporters. It’s no longer beyond the realm of possibility. “The Internet was a way to connect computers, and now it can be a way to connect brains,” said researcher Andrea Stocco, assistant professor in psychology at the University of Washington. “The next step is having a more equitable two-way conversation directly between the two brains,” he said. The future is now; all that remains to be answered is whether or not ethical considerations will evolve along with the technology, or will simply be bypassed altogether.